Thanks to its traditional looks and high-quality construction the Kresnik Multifuel Woodburning Stove is one of the nation's favourites! You may be thinking what it means when we claim this stove to be Multifuel – well as the name suggests you can burn multiple different types of fuel to get your fire started. They easily burn peat/ turf briquettes, smokeless fuels and anthracite. Not only is it super functional but this stove is eco-friendly id used in conjunction with wood from a sustainable source. 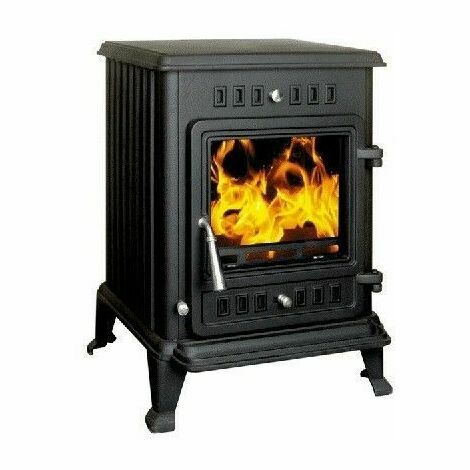 Manufactures from high quality cast iron this stunning stove is finished a beautiful matte black. Only the most high-quality manufacturing techniques have been used for a durable and reliable product. This wonderful stove will undoubtedly improve the look and feel of any room, this is all thanks to a generous heat output which will keep it cosy and warm – perfect for those chilly winter evenings.